Legendary Owen-Withee Head Coach Al Guthman retired from coaching the girls basketball team at the season’s conclusion. 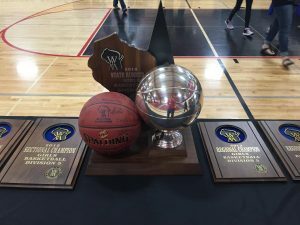 On Saturday, the school district hosted a retirement ceremony to honor Guthman’s legacy, which includes 710 wins, 8 trips to state and 4 silver balls, 15 conference championships, and 18 regional championships. His most special memories include coaching his daughters and each trip to state. In retirement, though he’ll be busy spending more time with his grandkids, Guthman plans to still watch the girls basketball team play when he gets the chance. Time might have gone by fast, but he won’t regret his career and the many great people he met along the way. “It’s gone too fast, but it’s been a real ride,” he said.